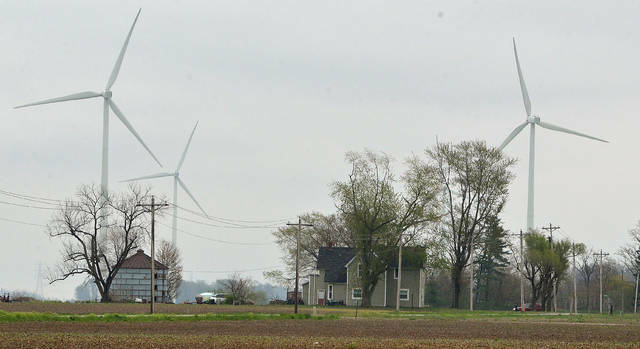 TOLEDO, Ohio (AP) — Wind energy’s future in Ohio is at a crossroads. Ohio over the past three years has seen new plans for large-scale wind projects come to a halt because of moves made by the state legislature. What comes next is likely to help determine whether wind turbines will be a large or small part of the state’s energy portfolio in the years to come. Plans for new wind farms have been stalled since lawmakers in 2014 installed a rule that requires wind turbine blades to be at least a quarter-mile from the nearest property line. Supporters of the rule said it protects homeowners who don’t want the towers near their properties. Over the past three years, only those projects that were approved before the setback rule was put in place and exempt from the restrictions have been completed. The majority of new wind projects that have gone up as of late have been small installations of just a few turbines to power factories and small businesses. Because the setback rule is still in place, some developers say they are bypassing the state for now. One company has five projects on the drawing board that it says won’t move forward until the state rolls back its restrictions. Ohio ranks in the middle of the pack among all states when it comes to wind energy capacity, but it lags behind all the Midwestern states and its neighbors, except for Kentucky. With utilities scaling back on coal and nuclear power, there’s more for room wind projects in the state, but natural gas is positioned to become a dominant energy source with close to a dozen plants being built or in the planning stages. Backers of wind energy again are making an attempt to ease the state’s restrictions, proposing legislation that would allow construction of wind turbines closer to property lines. Republican state Sen. Matt Dolan, the primary sponsor, said under the plan counties will have the final say on whether to approve the wind farms. While both Republicans and Democrats have signed on to support the bill, getting it through the GOP-controlled legislature will be a challenge based on its past support for the tighter restrictions. On the flip side, a state board that regulates wind farms sites has before it a change that would force wind developers to get the approval of more property owners before they could construct their turbines. The American Wind Energy Association this month said that proposal would be “a death sentence for wind energy” in Ohio. Republican state Rep. Bill Seitz said the proposal is better than one pushed forward last year. But he noted that some neighborhood groups fighting wind farms don’t like the plan before the state siting board because they say it doesn’t go far enough.